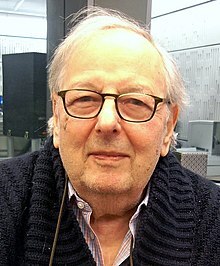 André Previn (born Andreas Ludwig Prewin; April 6, 1929 – February 28, 2019) was a German-American pianist, conductor, and composer. André Previn was born as Andreas Ludwig Priwin to a Jewish family in Berlin, Germany. He may have been born in 1930, but cannot be sure as his birth certificate was lost when he emigrated to the United States with his family in 1939 to escape the Nazis. He became a naturalized citizen of the United States in 1943. When he arrived in America he lived in Los Angeles. He started to be well known by composing movie scores for Hollywood movies. In 1967, Previn became conductor of the Houston Symphony Orchestra and in 1968 conductor of the London Symphony Orchestra. He stayed with the LSO for eleven years. His television series André Previn's Music Night helped to make classical music popular in Britain. From 1976 to 1984, Previn was conductor of the Pittsburgh Symphony Orchestra (PSO), with whom he made another television series called Previn and the Pittsburgh. He was also principal conductor of the Royal Philharmonic Orchestra. In 1985 he became conductor of the Los Angeles Philharmonic, but because of disagreements he resigned in 1989. Previn made many recordings and composed many movie scores and other musical works. He also toured and recorded as a jazz pianist. Later he concentrated on composing classical music. Previn received many prizes and honours. In the United Kingdom he was knighted in 1996. He is particularly remembered in Britain for a guest appearance he made on the Morecambe and Wise Christmas Show in 1971 where Eric Morecambe (who called him Andrew Preview) pretended to play the Piano Concerto by Edvard Grieg with Previn conducting. When Previn told him he was playing all the wrong notes, Morecambe grabbed him by his jacket and said that he was playing "all the right notes, but not necessarily in the right order". Andre Previn was married five times. His fifth marriage was to the German violinist Anne-Sophie Mutter for whom he wrote a violin concerto. They divorced in 2006. Previn died on February 28, 2019 at home in Manhattan aged 89. ↑ Barron, James (February 28, 2019). "André Previn, Whose Music Knew No Boundaries, Dies at 89". The New York Times. Retrieved February 28, 2019. This page was last changed on 28 February 2019, at 20:33.